If you have a raised deck, don't ignore all of the potential for the patio under your deck! Raised decks are a great way to maximize the space in your backyard, particularly if you're in a neighborhood with small plots. By building a raised deck, you're doubling your outdoor space, take advantage of it. From storage to entertaining, the possibilities are endless. Here are some of the most popular under deck patio ideas. The search for storage space is a never ending one, particularly if you have limited space. Garages are popular options for storage out of the common living space. However, some homeowners don’t want to give up their car’s parking spot or their garage is already full! A backyard shed is another common solution. If you have limited yard space, you don’t have to sacrifice your green space for more storage. The open area under a raised deck is the perfect place for a storage shed. It’s also a great option for those who want a shed, but have Homeowner’s Association regulations limiting any extra structures on their property. This under deck area is unused space that has a pre-existing frame for a shed. When it comes to building walls around your under deck area, there are two designs that depend on your deck height. If your deck is only tall enough for a crawl space, you can skirt your deck. This is a shorter wall and can look like a raised foundation depending on the material you use. The other design is a standard wall. This can be used for decks that are on the second floor or above. These two designs share the same material options that can complement your home style. Lattice panels are a traditional outdoor material for walls and privacy screens. Because of the open design, it’s not always an ideal choice for full shed walls. However, it is a common material for skirting a deck. Lattice gives the home a traditional look that is reminiscent of a white picket fence. It’s best used in drier climates where you won’t risk extra moisture getting into your storage space. If you want to create a seamless look between the rest of your house and your shed, vinyl siding that matches the home is the answer. Garages and sheds typically have siding that matches the main house to create a cohesive design. There are several benefits that come with choosing vinyl siding. Not only is it durable, but it’s also very affordable. It will hold up to weather conditions in any climate and will have low maintenance costs. If you have a modern or contemporary home design, wood paneling is a simple and beautiful way to close off your under deck shed. Look for rot resistant woods that also have naturally warm tones, such as teak and California red wood, to create your panels for the walls. These will ensure the structural integrity of your shed. Rich wood tones help you achieve a more expensive look at a lower price. Choose from maintenance free staircases to find the right staircase between your deck and patio. Salter’s consultative designers are ready to answer all questions and start your project today! If you add walls to your under deck area, you’re shutting out most, if not all, of the natural light that would normally fill the space. It’s important to have a lighting solution that will last outdoors. Although your shed is enclosed, the lights will still be subjected to more elements than those inside your main house. Solar powered lights are a great option for those who don’t want to rewire for a single light in their shed. Most solar powered shed lights come with a solar panel that you mount outside of your shed and a thing cord that runs into the shed to the light itself. The light is completely self-sufficient and requires no extra wiring. It’s a single light that can easily fill your shed with light at night or in the early morning. If you want a more polished look to your shed’s interior, recessed ceiling lights are built into your ceiling and are easily turned on with the flip of a switch. You can add as many as you want around your shed to make sure the entire structure is filled with light. This lighting option would require some rewiring, but it provides the most light to your space. While you may not be putting couches and tables in your shed, the furnishings are just as important. Depending upon what you’re storing, your furnishings will change. However, organization is always an important part of maximizing your storage shed. You can avoid clutter and create an organized space through your shed’s furnishings. This is the easiest and most common way to organize a storage space. Things on shelves are easily viewed and accessible. You can have shelves built into the walls of your shed for maximum use of your space. You can also build a free standing shelf and use that instead. Once the shelves are installed, you can organize them in whatever way makes sense for your lifestyle. No matter how you organize them, you’ll save yourself the hassle of looking for things in a chaotic space later. Many people like to use hooks to organize their tools in their shed or garage. By keeping them out in the open, you know where everything is and what’s out of place. Pegboards are the perfect place to install a large quantity of hooks. Not only does it give a large area to hang things, but it also frees up any floor space that was previously taken up. This is great for those who want to store a tractor or lawn mower, but also have storage space for their gardening or power tools. Turning your under deck area into a storage shed can easily be a weekend DIY project. The first question about any area under your deck is, “What if it rains?” There are two steps you need to take to ensure the safety of your items from water damage. The first is to create a drainage system between the floor of your deck and the ceiling of your shed. By creating a waterproof under deck roof, you are ensuring the longevity of your shed design. You can install a under deck roof in an afternoon as an easy DIY project. Many homeowners use rust prohibitive aluminum panels that feature small troughs that catches the water and drains it to the gutter lining the side of your shed. The visible side is an aesthetically pleasing beadboard design while the top is an effective drainage system. The next step is to lay a floor. Many people pour concrete if there isn’t a patio already in place. This is a durable and cheap way to keep your items dry and safe from the elements. The last piece of the structure is the walls. Because you’re creating a room out of an underdeck area, the frame is already by your deck’s supports. Using these are your guide, you can install your wall material of choice and any interior support you may need. Screened in porches are a great option for those that want to have flexibility with their outdoor space. Commonly called three season rooms, they are a porch that is closed off from the rest of the backyard with screens. By using screens and not full walls, you’re still allowing the breeze into your room, but have protection from rain and bugs. Depending on the screen, it can be an added privacy measure as well. Screened in porches are an extension of your indoor living space. These indoor/outdoor rooms can be enjoyed three seasons of the year in mild climates and left open all year around in warmer areas. By choosing to screen in the space underneath your completely open deck, you are able to keep the best of both worlds. While your screened in porch won’t have solid walls, it will have screens closing them off from the rest of the backyard. Depending upon your budget and how much flexibility you want from your porch, there are two different screen options. They both create different experiences in your space. If you’re still concerned with extra moisture in your space, you can install waterproof curtains that can roll down over the screens. This is the most common screened in porch design is one that features permanent screens as walls. This means that the screens are built into your frame and cannot be easily removed to open up the space. These screens are significantly cheaper than the second option, making them the more popular choice. By keeping the screens permanently in place, you are creating a sunroom that is completely separate from the rest of your backyard. Retractable screens give you the flexibility of having a screened in room or an open porch. Retractable screens are installed with a motor that pulls the screens up into a track when they are not in use. By allowing you to choose between screens and open air, you can create a new space. If you want to separate your room or just want some extra protection from the sun, you can pull down the screens. If you’re having an outdoor party, you can open the room to create a larger entertaining space. When you’re creating a screened in porch, you want to have the right ambiance for your space. Lighting helps you to create the environment that you want to spend your time in. You want a light that can stand up to the outdoors, especially if you have retractable screens, but you don’t want to sacrifice any design aesthetic. Many light fixtures that are attached to the ceiling, such as chandeliers and recessed lights will not meet building code due to the close proximity to nature. However, there are a few aesthetically pleasing, but durable lighting options for your screened in porch. Rope lights are the perfect way to subtly add light to your screened in porch. They are string lights that are enclosed in a clear heavy duty PVC case that is both waterproof and UV resistant to protect your lights. Even though they are made to stand up to the elements, they are still flexible enough to be wrapped around a railing. One way to incorporate rope lights into your screened in porch is to line them around you’re the edge of your under deck ceiling. This gives your space some light without direct exposure to the lights. If you want a more decorative way to achieve indirect light, you can use wall sconces. These light fixtures come in a wide variety of styles that can fit into any home décor. While this may seem like an interior only option, a screened in porch provides enough shelter that you won’t have to worry about them being exposed to the elements. The wall sconces would be attached to the exterior wall of the house in the screened in porch. This is not only the most stable option, but also keeps all wiring in the house itself. As with any indoor space, your under deck screened in porch can be defined by the furniture and décor that you put in it. You can create an exotic getaway or a calming retreat just with your furnishings. Many people choose to create a small living room in their screened in porch. Here are some ideas of what to put in your three seasons room. If you plan on creating a second living room in your screened in porch, seating will be the most important piece of furniture. You want a comfortable place to sit and enjoy your room. If you want a traditional porch style, wicker furniture is the obvious choice. It has a rustic charm to it that you can’t find with other outdoor chairs and couches. It can be easily painted to become a one of a kind piece that matches your home décor. Different combinations of couches, chairs, and cushions can be used to create the best seating situation for whatever you want to use your room for. Where you have seating, you should have some kind of table. This is especially true if you plan on doing any kind of entertaining in your space. If you want to keep the living room aesthetic, coffee tables are a great centerpiece. They give you and your guests a gathering place and the room a central focus. You can add extra surfaces with accenting end tables. There are wicker table designs that would fit perfectly in a quaint design aesthetic or wrought iron designs for a Victorian look. Find the perfect stair solution to move between your deck and patio with Salter’s outdoor spiral staircases. Choose between 2 product lines to find the right match for your deck. To build your own screened in porch, you will need some building experience. While it’s not as complicated as building a suspended deck, there is some intermediate construction needed. You will need to install the bottom frames, railings, and balusters. After you’ve constructed the frame, you can install the screens. Permanent screens are much easier to install, as you don’t have to install any of the motor track that comes with a retractable screen. Many people who decide to finish their under deck area want to use it for outdoor entertaining. One popular under deck patio idea is to create an outdoor dining area for you and your guests. 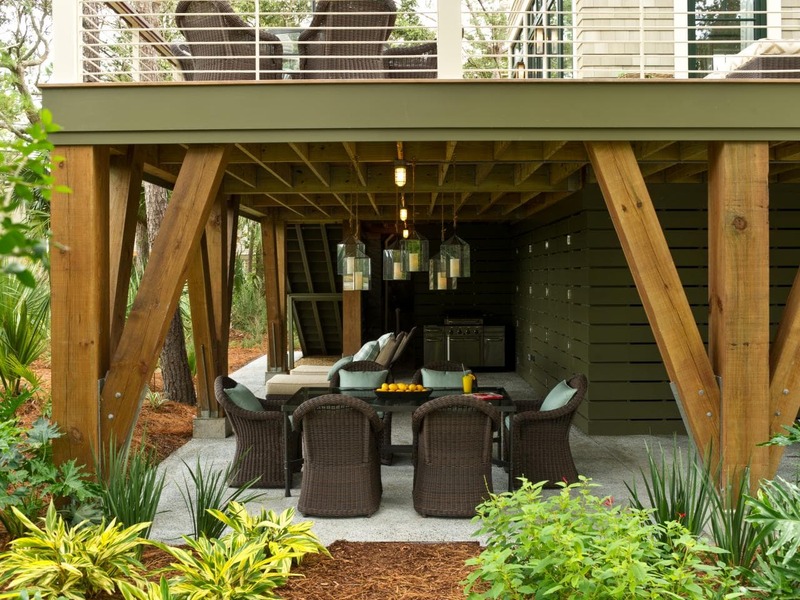 While you can create this space on your deck, an under deck dining area gives you protection from the elements. One way to make the most of the two spaces is to create an outdoor kitchen area on your deck with food prep areas and your grill. You can connect the two spaces with deck stairs. If you want to keep the footprint small, you can use a spiral staircase for a unique and compact way to access your patio under the deck. This keeps all of your entertaining outdoors and keeps too much foot traffic from going in and out of the house. Part of any dining area is the ambiance that is created in the space. A huge part of the experience is the lighting. Depending upon what lighting option you choose, you can change the tone and overall décor of your space. You can go as simple or as decorative as you’d like with your light fixtures. The aesthetic of your space can also change depending upon how you decide to incorporate the lights into your under deck area. Bistro lights are a popular option for outdoor dining areas because of their restaurant like aesthetic. Bistro lights are string lights that have larger clear bulbs so you can see the internal wiring of the bulb. Think of them as a trendier alternative to basic white lights. They can be hung across the ceiling to create a draped effect. Bistro lights can also be taken down and replaced with other lighting fixtures if you decide to change up your space. When the weather is nice and you’re eating outside with guests under your own awning of lights, you’ll feel like you’re in your own personal restaurant. Hanging lanterns are a more traditional approach to your outdoor lighting. They come in a variety of designs, but they are typically made out of a metal frame with glass panes that allow the light to pass through. They can either be hung by a handle attached to the top of the lantern or mounted to the wall, much like the previously mentioned wall sconce. They complement traditional or rustic home designs and are similar to old Colonial designs. If you want a more eclectic look to your under deck dining area, you can look for lanterns that have stained glass. These help create an exotic aesthetic in your own backyard. You can change the light source in the lantern to create a different atmosphere in your space. There are several different kinds of lanterns that have lightbulbs and can be wired to turn on with the flip of a switch. If you want a softer lighting option, there are still several designs that are made for candles that you would have to light each time you want to use them. If you want to keep the light concentrated to the table and seating area, you can use table top lights just as you would indoors. Obviously the designs themselves would be made for outdoor applications. Table top lanterns are a great option for a softer light option. You don’t want to harsh of a light source in the center of the table. By using lanterns that have translucent sides, you are able to have some light shine through, but no one feels like they have a spotlight on them. Another popular light option that doubles as a centerpiece is a candle in a large votive. You can anchor the candle with seasonal decorations, such as seashells, or with small decorative pebbles for a year round design. While the sides are completely clear glass, the candle isn’t as harsh as a standard lightbulb. If you want to create a multifunctional table top light source, you can use a citronella candle that not only illuminates the space, but helps to keep pesky bugs away from you and your guests. The previously mentioned rope lights are a great lighting option for your outdoor dining space. Their weather resistant case make them ideal for your outdoor space and they have a lot of versatility. You can get them in a classic white or if you want to create a more unique space, there are plenty of colored lights available. They can also be wrapped around and deck support columns that frame your dining area, or around the handrail of your deck stairs that connect your different outdoor spaces. Once you’ve defined your space and decided on your design aesthetic, you can create your ideal dining area by choosing your furnishings. The obvious furniture needed for an outdoor dining area are a table and chairs. This may seem simple but there are so many different options out there that cater to different design aesthetics. Depending on your desired style of your under deck dining area, you have a few different material options for your outdoor dining table. All wood tables give a very rustic and charming feel to the space. Large farm tables are perfect for outdoor entertaining. They are designed to cater to a large group of people. They also fill your space which can make your under deck area feel larger. The other common outdoor dining table option is a metal frame with a slate or stone top. If you’re looking for a metal frame table, aluminum frames are going to be the most durable as they are naturally rust prohibitive. There are a few different options for the table top of a metal frame table. Slate tile outdoor tables are usually removable and give a simplistic design. If you want a more decorative table top, stone mosaics can make your table both a decorative and functional piece. A smaller dining area can feature a small round wrought iron café style table. This creates a more intimate dining experience and allows you to use your space for multiple purposes. These tables normally seat two to three people. Depending on your table choice, you can choose your seating design to match the décor. All wood farm tables are often paired with all wood benches that create the communal style that comes with an oversized farm table. If you decided on a more formal metal frame and stone table, you can usually find a chair set that matches the frame. There are several dining sets that include both the table and chairs. If you decide on the café tables, mismatched chairs that complement each other add to the quirky style. There are several DIY projects that can be used in your outdoor space. Large farm tables and benches are often expensive as they are custom pieces. You can create your own rustic table and benches by using reclaimed wood. The homemade pieces add another touch of rustic charm to your space. If you have metal frame chairs but want to add a level of comfort, DIY outdoor cushions are an easy afternoon project. You can find outdoor fabrics that fit into your space and make cushions that are one of a kind and completely unique to your space. Another common application of outdoor entertaining spaces is to create an outdoor living room. This space is ideal for casual entertaining or just relaxing on a day to day basis. You can create an even more casual and comfortable space by channeling the recent trend of conversation pits. A conversation pit is a large couch or comfortable oversized cushions that are arranged in a square or circle around a central point. It is a communal area where you and your guests can relax and catch up. With the casual environment of a conversation pit, you want lighting options that aren’t too harsh. Softer lights allow people to feel more at ease, while harsh lights are too severe for the cozy nature of the conversation pit. Lights define your space before you even put the furniture in the under deck area. Depending on the light fixtures that you choose, you can change the space dramatically. These lighting options help you to create two different spaces with the same purpose. Oversized lanterns are a trendy lighting option that provide soft light to your conversation pit. These lanterns are the same basic design as the hanging lanterns mentioned above, but on a larger scale. These can be placed on small end tables or the ground surround the conversation pit. By using candles in the lanterns, you are able to have a softer light. If you want a more unique design, skip the square lanterns and replace it with an orb lantern. The sphere is a more interesting design that achieves the same effect. String lights have a whimsical nature in their design. They can be strung across the ceiling to create a night sky effect. It provides overhead light that isn’t harsh like standard ceiling lights. You can choose white lights that have a warmer tone to them to add to the ambiance of the space. The strings can easily be wrapped around railings and columns, much like rope lights for more light in the surrounding area. They are easily removed and replaced to change your space’s design. Furnishings are the most important part of your conversation pit. While you want to create the right setting, comfortable seating is what will make your conversation pit. It’s what will define your under deck space. You also want an interesting centerpiece to your conversation pit. A communal area should have large seating areas positioned around a central point, often a conversation piece or something with entertainment value. Wrap around seating is a defining feature of your conversation pit. Wrap around couches have a communal nature built into them. They cater to large groups and wrap around so your guests can face each other while sitting comfortably. If you think you may want to change your space around later, you can keep your conversation pit above ground. This consists of a regular outdoor wrap around couch. If you want a permanent design, a unique under deck patio idea is to build your seating into the floor. This includes small stairs leads down into your conversation pit and a sunken couch. You want an interesting centerpiece to your conversation pit for everyone to gather around. While open fire pits won’t meet building code, table top fire pits are the perfectly safe for your under deck area. Not only do they give off warmth and light, but they also have the table top around the fire for convenience. For an extra safety measure, you can get table top fire pit designs that have glass walls around the fire. This creates a cozy atmosphere just like a living room. There are several different DIY projects for outdoor seating. If you want a particularly deep couch, pallet furniture is a great option. The pallets are wide enough to create a large surface and you can alter the design to be as long as you want. DIY outdoor cushions are another popular project. You can choose whatever outdoor fabric would best match your design aesthetic and make oversized cushions for extra comfort. You may have limited green space behind your house, but have a great deck. 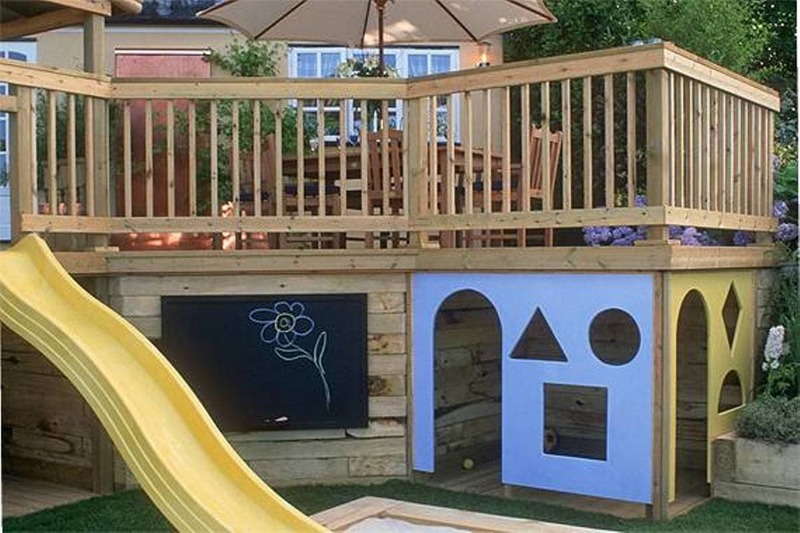 Take advantage of your under deck space by creating at kid’s play area. If you have plenty of backyard, this play area is a great place for the kids to play on particularly hot days. The deck above the play area provides shade. This under deck patio idea is perfect for climate with particularly hot summers. If you want to contain the space even more, you can add railings and a gate to keep it completely closed off from the rest of the backyard. Lighting in a play area is more for a functional purpose than adding to the design aesthetic. The main focus is being able to see your children clearly if it’s dark outside. This means brighter lights than if you were creating a cozy outdoor entertaining space. Wall lanterns are the perfect option for a kid’s play area because of their versatility. Whether you want a simple light that will get the job done or you want to match your exterior home style, you can find a lantern to meet your needs. Instead of using candles, you can use lanterns that use lightbulbs for a brighter light option. This will emit enough light to fill your space. These multi-application lights make another appearance in this guide. It’s clear that their possibilities are endless. If you want overhead lights rather than wall lights, use rope lights. As you saw in the screened in porch section, you can line the ceiling’s perimeter with rope lights. But you can also use them across the entire ceiling. If you leave deep grooves in your under deck ceiling, you can secure the rope lights into these recessed spaces. Their weatherproof casing makes them ideal for this application and a better option than other ceiling lights. They will be protected from any excess moisture than may come through the deck floor above. The furnishings in your under deck play area will be a little different from other under deck design ideas. You won’t have as much furniture in your design as built in activities for the kids. Have some fun when choosing your additions. The possibilities are endless and will depend on your child. Here are a few design ideas to create a fun space for you and your kids. Use some of the same design from the under deck shed design and create a play house underneath your deck. This can be as large as the entire under deck patio or can just be a section. If you live in an area that tends to get a lot of rain, this gives the kids somewhere to play even when poor weather hits. You can add a small table and chairs inside the play house to complete the design. You can incorporate this classic backyard feature into your under deck. One benefit to keeping your sandbox under your deck is that it won’t heat up quite as quickly on sunny days. This makes it more comfortable for the kids to play in. Some homeowners decide to create a sunken space in the patio for an in-ground sandbox. If your patio features wood flooring, you can use removable floor boards to cover up the space when it’s not in use. While most of the furnishings in this under deck play area are fun and kid-centric, a table and chairs can easily be incorporated as a place for parents to sit while they watch their kids. This can be as simple as a picnic table and benches. You’ll probably want to keep the size of your table and chairs smaller to provide more space for the play area. All of the furnishings listed above have several different DIY project plans. If you set your mind to it and have nice weather, you could complete your child’s play area in a weekend! If you plan to use the in-ground sandbox design, it will take a little more planning as you will have to dig underneath your under deck patio to create the space for it. There are several benefits to dog kennels in general. It provides an open space for your dog to exercise freely. It also keeps your dog away from problematic areas, such as flower beds they might dig up and or inadequate fences. Your under deck area seems like a natural place to build your dog kennel. It has an existing frame and has a built in roof to shelter your dog from bad weather. Your dog kennel will have the same basic structure as a under deck shed. You will need to enclose the space using your deck support columns as the basic frame. Your materials will be much different than a shed, as you will want to have open walls that allow airflow in the space. Fences are the most economical wall option for your under deck dog kennel. Because of its low price, it’s the most commonly used material to close off your space. The most important thing to keep in mind when you install a fence for a dog kennel is to secure the bottom. If you have a small to medium sized dog that likes to dig, there’s a chance that they will manage to get out of the kennel underneath the fence. You can secure the bottom by installing rebar every few feet of the fence. 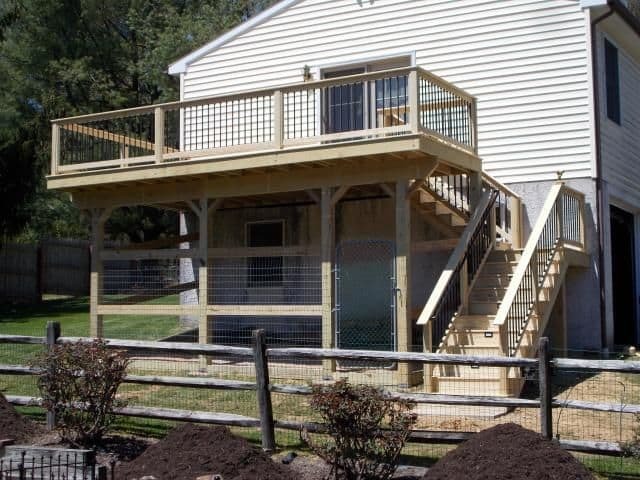 Using screens as walls for your under deck dog kennel is a little different from a screened in porch. There would be virtually no reason to use retractable screens, as that defeats the purpose of closing the space for your dog. While screens are a little more expensive than the previously mentioned fences, they provide extra shelter for your dog. It keeps out any bugs and provides a little more coverage from rain than a completely open fence. It will also give more shade for any sun coming in at an angle. The lighting options will be very similar to those used in the kids play area. The purpose of the light is not to create an ambiance, but rather provide enough light for you and your dog at night. You have a few more options for lighting as you can attach it to the exterior fence. The other benefit you will find is that all lights that are meant for dog kennels will be weather proof and ready for outdoor use. Wireless lights are popular for the obvious reason of not having to rewire any of your electric system to have a light outdoors. Most dog kennel lights come with the hardware and design to be hooked on to a fence. Wireless lights are powered by batteries and come with a remote control. The batteries will have to be replaced every so often. Some dog kennel lights come with motion sensor built into the light fixture. You will be able to choose how long the light stays on after the motion is detected based on the light fixture model and the predetermined settings. Some models do come with a remote as well. This gives you the ability to turn the light on and off whenever you choose. Not only do you want your dog to be safe, but you also want them to be comfortable and happy. This will all depend on the homeowner and their dog. While some homeowners may go much more extravagant with their dog kennels, others may keep it simple. Here a few ideas for all homeowners on what to put in your dog kennel to keep your dog happy. One of the most important things to have in your dog kennel is a water bowl. If your dog spends a lot of time outdoors, this is essential, especially during warmer weather. While you can just put a water bowl outside and call it a day, there are a few different options for those who want some creativity. To create a spill proof water bowl, take an old tire on the smaller side and paint it however you want. When it’s dry, fit your dog’s water bowl in the center. This raises the water bowl off the ground and keeps it from being knocked over. This ensures that your dog will always have water. For a more extravagant water bowl, use an outdoor dog water fountain. These operate the same way as a garden water feature. It has constantly running water and recycles any of the over flow in the bottom basin. If your dog will be spending a lot of time in their kennel, consider putting a dog bed in the space for them. While you may not want to put an expensive indoor cushion outside, there are plenty of outdoor friendly dog bed options. The easiest and simplest option is a large outdoor cushion. By covering the cushion with outdoor fabric, you can ensure that it will stand up to the elements. If you want to raise the bed off of the ground, you can use a wooden frame that has been treated and sealed to last outdoors. 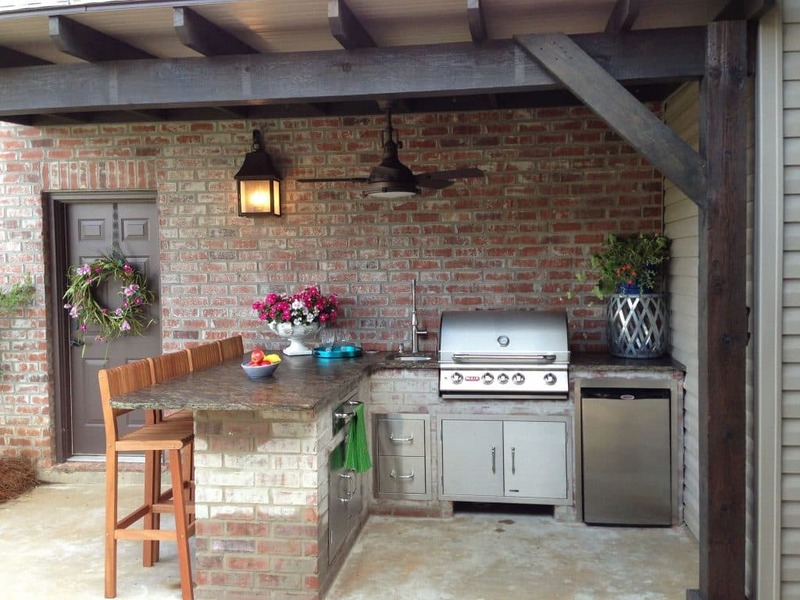 Outdoor kitchen areas have evolved far past a grill on the deck. Some outdoor kitchens now include mini fridges, ice boxes, and counter space. With all of these new additions, it’ll need its own space. That’s where an under deck kitchen area comes in. This takes the same concept that was mentioned in the dining area section and reverses it. By keeping your deck and patio in zones, you’re creating a more efficient outdoor entertaining experience. Connect the two areas with a spiral stair to keep the footprint small but still aesthetically pleasing. If you plan on cooking outside, you’ll need good lighting for safety reasons. Bright lights will help you see exactly what you’re doing. Under deck ceiling lights very rarely meet building code because of the large possibility of extra moisture reaching the wiring. However, there are a few alternatives to create a well-lit space. Installing lights into the counter space of your under deck kitchen is one way to ensure that your food prep space is well lit. The wiring is all inside of the counter protecting it from the elements. If you want a more economical way to add lights to your outdoor counters, use the trusty rope lights. They can be secured to any surface you choose with hooks and zip ties and can stand up to weather. One of the benefits of task lighting is that it provides pure white light. This allows you to have a bright work space and clearly see the food. If you plan on having the dining area separate, this bright light won’t be bothersome to any guests. Think of your outdoor kitchen like you would your traditional indoor kitchen. Depending upon how you want to use your kitchen, your furnishings will change. If you like to entertain outdoors often, this will be a heavily used space and you should love the hub of your backyard space! There are a wide range of possibilities of furnishings for your outdoor kitchen depending on your expected use and home style. The recent trend of outdoor kitchens has seen a wide range of appliances outside. It can be as simple as a standard grill. The most extreme outdoor kitchens have extra counter space, a stovetop, and a mini fridge. Obviously you will want to use appliances that will stand up to the elements and last outdoors. Some homeowners even have a dishwasher installed into their outdoor kitchen to truly keep the entire process, beginning to end, outside. While you may want to keep the primary dining space on the upper level of your backyard space, you can incorporate a small seating area into your outdoor kitchen. If you have a counter, bar stools are a popular option. This keeps the seating area to a minimum and uses the surfaces that are already build into your kitchen area. You can add a dining table and chairs to the other side of your under deck patio if you have the space. If you entertain outdoors often, you’ll know the importance of variety in activities. By using your deck and under deck area, you are create lots of space for your guests to entertain themselves. You can use deck stairs to move from one level to another to keep most foot traffic outside of the home. Depending upon what you choose to put in your game area, it can easily be changed around. The lighting in your game area should be bright but not abrasive. This allows you and your guests to enjoy your game area no matter what time of day it is. You want to avoid harsh lights for the comfort of your guests. As with most outdoor entertaining spaces, you want to avoid the spotlight aesthetic. There are a wide variety of lanterns that you can use in an outdoor game area. The previously mentioned wall lanterns are a great option for lighting that fills the space but is out of the way. Another option are hanging paper lanterns. These are a great option for a fun party space. They come in a wide variety of colors and can be found at low prices. You can use string lights for your game area in the same way you would use them for any of the other applications. You can string them across the ceiling to completely light up the space without adding harsh true white light. You can find different color lights or a multicolor set depending upon the design you want for your under deck area. There are several things you can put into your under deck game area. Whether it be comfortable seating or outdoor entertainment, there’s a wide variety based on what you plan on using the area for. They can easily be changed around when you want something a little different in your space. Oversized backyard games are a popular outdoor entertaining idea. Not only are they easily put together, but they can be put away when they’re not in use. Some examples of popular oversized games are Giant Jenga and backyard checkers. These large scale board games are fun for kids and adults. If you want a few different possibilities for your under deck game area, a multifunctional table may be the answer. There are several table designs that change their purpose by changing around the table top. With this piece of furniture, you are able to play ping pong, pool, and air hockey on the same table. A space maximizing under deck patio idea is to use multifunctional furniture. While you want your guests to have fun, you also want them to be comfortable. Keep the seating casual to match the environment. Oversized outdoor cushions in bright colors are a great way to provide seating without the formality of the outdoor dining chairs mentioned above. They can easily be moved around the space and can be cleaned when needed. Outdoor fabrics are made to last through harsh weather. 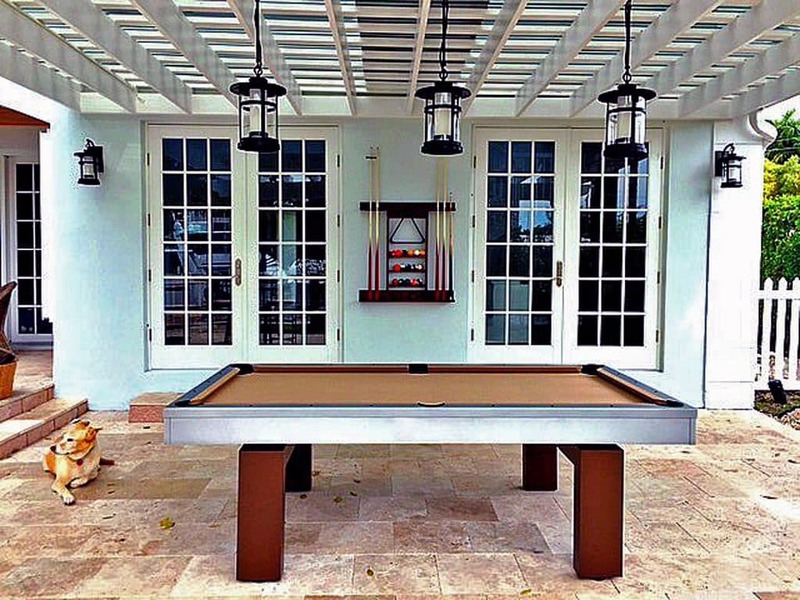 There are several features of your under deck game area that you can make into a DIY project. Many oversized backyard games are easily made in an afternoon. Giant Jenga can be made from lumber and different color paint in a few hours. You lay tiles down on your patio floor to create a checkers board and use pained wood as your game pieces. Your outdoor cushions are a simple sewing project. If you can’t find an outdoor fabric that you like, you can always paint one! Find a plain white outdoor fabric and hand paint it with the pattern and colors you want and seal it with a waterproof coat. When you add a raised deck to your home, you create more square footage that can not only add value to your home, but also make your outdoor space more enjoyable. This post gave you plenty of ideas when it comes to how to use your space. When you choose a way to access the patio under your deck, a spiral stair can help you safely move between the levels without the large footprint of a traditional deck stair. For accurate and quick pricing, call our consultative designers at 1-800-368-8280. They can help you with everything from the width of your stair to which way it should rotate!